Lenovo tab 2 a7-10 runs on the latest Android 4.4 Kitkat(Up-gradable to Android 5.0 Lollipop). It makes system run in a good flow by optimizing memory will improve your touchscreen which will allow it to respond faster. This means you can do web browsing, listen music, play latest game without facing any difficulties. Lenovo Tab 2 A7-10 Tablet specification has average technical features like 8GB internal storage with 1 GB RAM. This device supports Memory card up to 32 GB. On the other hand it's camera features can make you upset as it doesn't have primary camera and secondary camera is just 0.3 which means this is not for people who are crazy about photography. This Lenovo tablet is fitted with 1.3GHz quad-core processor, which makes phone a faster performer and the handset will respond quickly. One can save and share much more data easily without facing any time-lag problems while multitasking. 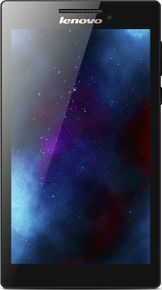 Lenovo Tablet comes with 3500 mAh battery size which is quite above average in this price range. This tablet lasts a day easily on average usage. You can talk for hours without any fear and even watch movies and do web browsing without thinking about battery drainage. So if you are looking to buy a phone which has good features with inexpensive price then buy Lenovo Tab 2 A7-10 Tablet online at lowest price by comparing from various online shopping websites like amazon, flipkart, etc. I had this my first tab. Its simply wonderful no jitters, fluid vibe ui, ram consumption is very low it happens when I reached with 500 apps installed in my internal but no question of lags. WiFi seems powerful Dolby made a good sound buster. Screen is nice with multiple viewing angle. I got a lollipop update instantly I popped my tab out after delivery.